Amazing European Researchers' Night at CosmoCaixa with the participation of the ICMAB! On Friday, 28 September 2018, the ICMAB and most of the research centers in Catalonia, Spain and Europe, celebrated the 2018 European Researchers' Night (named "Nit Europea de la Recerca" in Catalonia). The ICMAB was at CosmoCaixa Barcelona from 7 pm until 11 pm for a night of nanoscience and nanotechnology workshops and a talk on spin currents! The European Researcher's Night is an event celebrated in all Europe to boost public awareness of the importance of research among society. Together with the ICN2, the CCiTUB, the UB Physics and Chemistry Faculties, the IBEC and the IREC, we organized a night full of nanoscience, nanotechnology, materials science, physics and chemistry workshops within the "Young Research Night" in CosmoCaixa, coordinated by Jordi Díaz, from the CCiTUB and the ACCC (Associació Catalana de Comunicació Científica). Three workshops were performed for 25-30 minutes in parallel, from 7:30 to 10:30 pm, and each turn attracted the attention of 40-50/70-90/130-140 participants of all ages. We were really happy for such a great participation, and also because the researchers and communication officers of all the centers worked together as a team. The participants were introduced to the nanoworld and could see the implications of nanoscience and nanotechnology in our life. 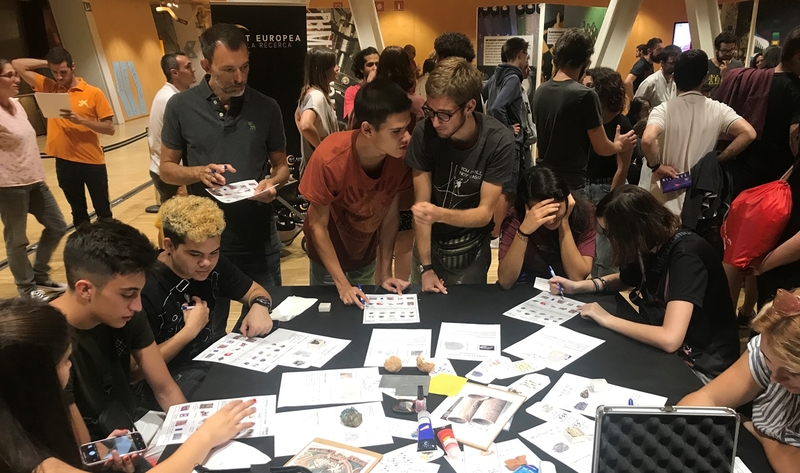 The other activity in which the ICMAB participated was in the microtalks in the "Scientific Corner", which took place in the Antartic Base of the CosmoCaixa. In this case, the talks also counted with the attendance of a high number of participants, around 60-100, per session. Josep Fontcuberta, researcher at the MULFOX group at ICMAB, gave a talk on spincurrents: “Electrons i espins: una parella més eficient si està trencada”. This was the first time that this event was celebrated in coordination all around Catalonia, and after five years in Barcelona. We are sure that the event will continue to happen, as it seems that people are really interested in research and science! All in all, a fantastic and amazing night, full of scientific activities and full of people! Thank you to Raül Toran, from ISGlobal and ACCC for coordinating the Scientific Corner and most of the activities of the European Researcher's Night in Barcelona. Mengdi Qian, Ignasi Fina, Milena Cervo Sulzbach, Florencio Sánchez, Josep Fontcuberta. Adv. Electron. Mater. 2019, 1800646.